Home Psychic Why is There More Government Workers Then Manufacturing Workers ? 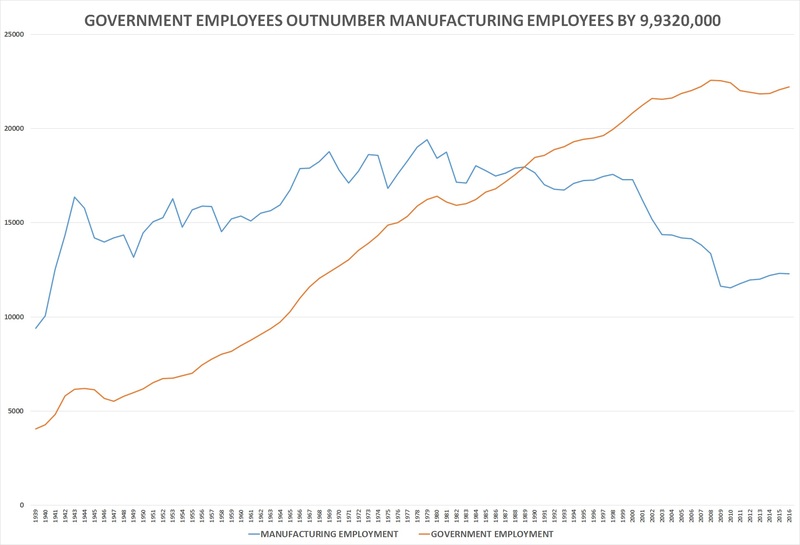 Then, in August 1989, the seasonally-adjusted employment numbers for government exceeded the employment numbers for manufacturing for the first time. That month, manufacturing employed 17,964,000 and government employed 17,989. From August 2015 and and August 2016 seasonally-adjusted manufacturing employment declined by 37,000–dropping from 12,318,000 last August to 12,281,000 this August. The 22,213,000 government employees in August, according to the BLS, included 2,790,000 federal employees, 5,120,000 state government employees, and 14,303,000 local government employees.